Should Penguins Ice 7 Defenders? April 5 was a dark day for Pittsburgh Penguins fans. You probably remember it; that was the day it was announced that Kris Letang, core of the Penguins’ defense, irreplaceable in everything from 5 on 5 play to special teams, would be out for four to six months with a herniated disc in his neck. Ever since that fateful day, the Penguins have been scrambling to cover up the flaws in their extremely depleted defensive corps through experimental pairings and desperate goaltending. Now, having already blown a 2-0 lead in the Stanley Cup Final, the Penguins’ defensive flaws are more apparent than ever. Where is the core of the problem? Could the answer be to try and play seven defenders? The Penguins’ offense looked as good as it has this entire Final in Monday’s 4-1 loss. They had 24 shots on goal, only two fewer than the victorious Nashville Predators. Sidney Crosby played one of his best games yet this postseason, and he and Jake Guentzel each saw incredible scoring opportunities. Unfortunately, the Penguins’ defense did not have quite as good of a night. 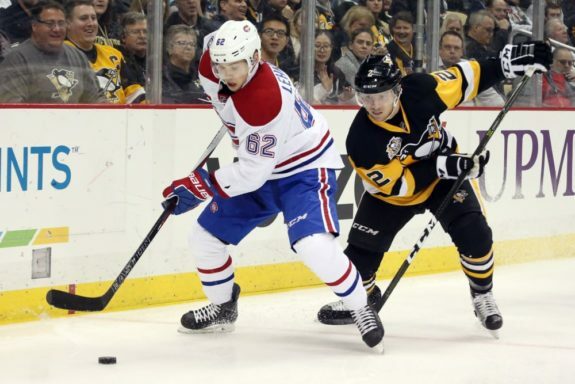 They struggled to win puck battles and clear the zone, attempting pass after pass through the neutral zone that ended up on the stick of a Predator. 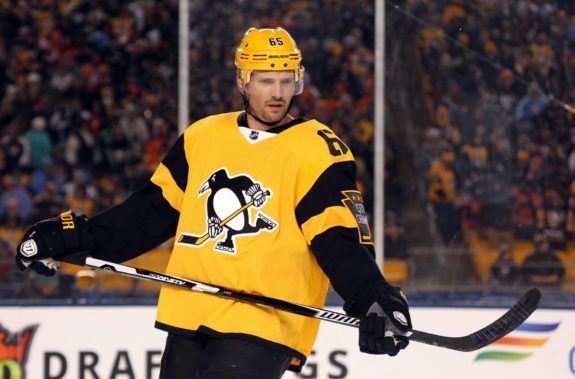 Based on the eye test, Ron Hainsey was the source of many of the Penguins’ problems. Although he only ended the night with a -1 rating, he was directly responsible for several turnovers that led to high-danger chances from the Predators. Corsi statistics back this up. For a player to have a Corsi For percentage (CF%) of over 50% means that when that player is on the ice, his team usually has control of puck. Hainsey maintains a CF% of 43.3 for the playoffs, meaning that more often than not, the other team is controlling play when he is on the ice. This is the lowest of any Penguins defender; for reference, Corsi rates Ian Cole as the Penguins’ most reliable core defender with a CF% of 47.8. Hainsey also has the most difficulty on the team keeping possession when moving out of the zone. According to Sportsnet, he maintains possession on less than a third of his tries to get across the blue line, again the lowest of any Penguins defender. You might notice that none of these numbers are stellar. None of the core Penguins defenseman have a Corsi For percentage of over 50% for the playoffs, meaning that on average, the opposing team has been dictating play. For comparison, five of the Predators’ six core defenders boast a playoffs CF% of over 50%. Not one of the Penguins’ defenders can say the same. This shows in how opponents have outshot the Penguins for the majority of the postseason. It is also correlated with the fact that none of the defensemen are, on average, successful moving the puck out of their zone. Besides Justin Schultz, whose blue line passes connect almost half of the time, most of their transition possession percentages fall far short of that halfway mark. So why pick on Hainsey specifically? Because, along with Dumoulin, he’s been part of the Penguins’ top defensive pairing this postseason, playing over 20 minutes of ice time per game. He’s averaging the most minutes and the least possession of the Penguins’ defense, which is a troubling combination. The eye test from Game 4 would tell you Hainsey’s inability to keep possession is a liability to the Penguins; playoff stats echo that. Adding a seventh defender could lessen Hainsey’s ice time slightly and serve as a possible life ring to throw to a drowning defense. Luckily for the Penguins, their seventh defender was just cleared to play. Chad Ruhwedel, diagnosed with a concussion in the middle of the series against the Ottawa Senators, is once again available. Ruhwedel is the only one of the Penguins’ defense with a positive Corsi For percentage this postseason (the team has controlled play 55.2% of the time when he’s on the ice.) Of course, he’s only played six games, and averaged thirteen minutes in each of them, so he hasn’t been tested quite like the other six defenders. But his possession percentage coming out of the neutral zone currently sits at 40%, higher than Dumoulin, Cole, Maatta and Hainsey. Ruhwedel certainly seems capable of playing bottom-pairing minutes for the Penguins. Who would the Penguins take out to put Ruhwedel in? Last game, coach Mike Sullivan scratched Scott Wilson to play forward Josh Archibald instead. Archibald didn’t have a bad game, but he only had five minutes of ice time, which is certainly replaceable. If the lineup stays the way it is, with Nick Bonino still injured, then the Penguins could afford to scratch Archibald or Wilson and add in another defender. Introducing another defender to the mix does add challenges to the lineup. It forces the offensive and defensive lines to rotate, which can mess with the chemistry of established lines and pairings. 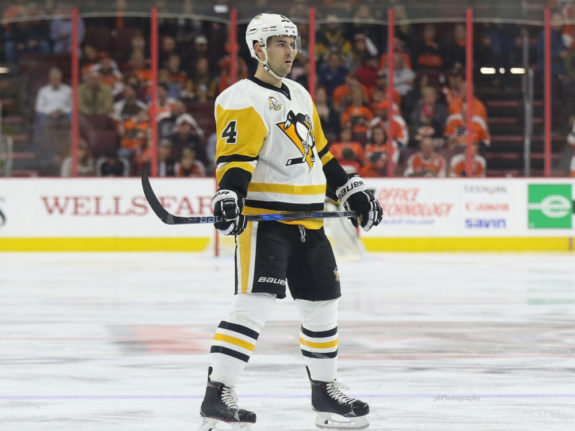 But Penguins offensive lines already frequently rotate within games, and let’s face it: we haven’t been seeing much chemistry between Penguins’ defensive pairings as of late. If the Penguins are looking to mix up the lineup and spark the team for a very-nearly must-win Game 5, putting Ruhwedel in the lineup could go a long way to reduce Hainsey’s minutes and change up pairings within a floundering defensive corps.